wire shelving, wire fencing and scanning hooks. 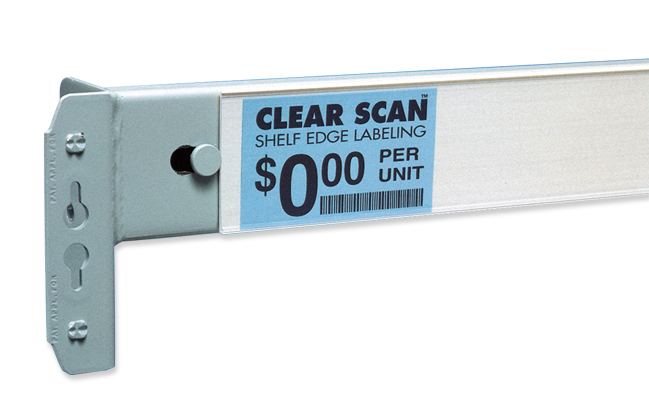 Clear Scan® Shelf Edge Labeling System Label Strips and Holders flex open at a touch for fast, drop-in labeling, then automatically spring shut to hold the label securely in place. This innovative approach allows use of inexpensive, easy-to-change, plain paper labels instead of hard-to-change, costly, messy adhesive stick-ons. 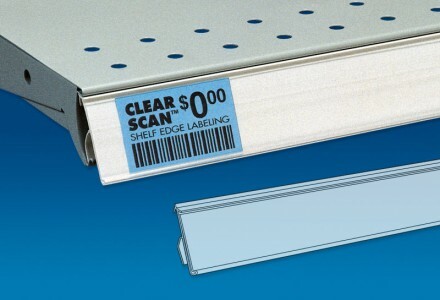 With Clear Scan you can save time, effort and money, scan more accurately, renew the appeal of tired shelves, beautify, and even attract attention and promote sales. 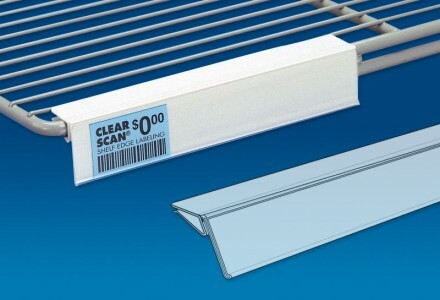 Clear Scan® Label Strips and Label Holders are forgiving PVC co-extrusions with a clear, see-through front and contrasting colored back. Readability and scanning accuracy are enhanced by use of an extremely high-quality transparent window material with built-in UV protection. This improved clear PVC front resists yellowing and darkening better than ordinary plastics, guaranteeing longer life and dramatically reducing replacement costs. The flexible, forgiving nature of the material provides built-in “memory”, allowing it to retain shape and secure labels for the life of the strip while simultaneously increasing customer safety.  Manufactured in a variety of profiles (shapes), they mount to all standard channel configurations, plus metal, glass, wood, wire baskets, wire shelving, wire fencing and scanning hooks. Gentle pressure on the bottom flexes open the top of the strip for quick label changes. When released, the strip springs completely closed, securing the label in place. 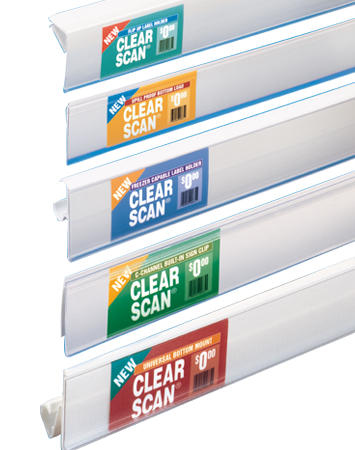 From discount chain to boutique, drugstore to supermarket, Clear Scan can improve operations, image and sales. 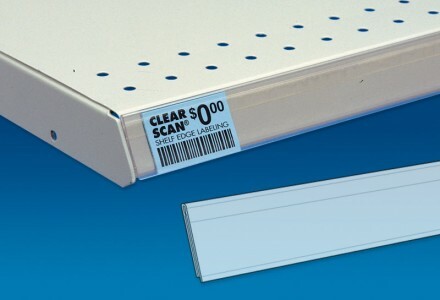 The ease of label changes and wear-resistant clear front save you time, labor, and money throughout the process. The advanced PVC construction retains “memory” and shape, resists yellowing, darkening and aging, increases safety, and lasts for years. Clear Scan is clearly superior™. Attract attention and motivate impulse buying with Clear Scan. Match or contrast existing shelves, fly the corporate colors throughout the chain, or even color-code individual departments to communicate a unique “sense of place”. 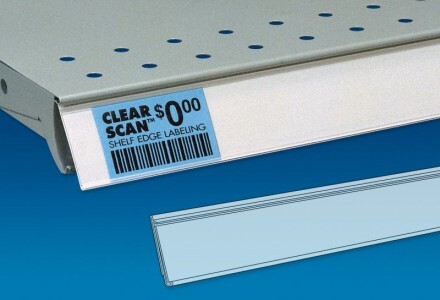 The vast assortment of Clear Scan colors and sizes allow you to renew tired shelving or beautify economically. And they last longer and look better than painted shelves. Size to fit your existing label system, or use oversize Clear Scan strips to make your labels even more visible and compelling. Clear Scan mounts directly to all popular makes of metal, wire, glass and wood shelving. Choose from magnetic, adhesive or clip-on for all your label strip, label holder and small-scale sign applications. 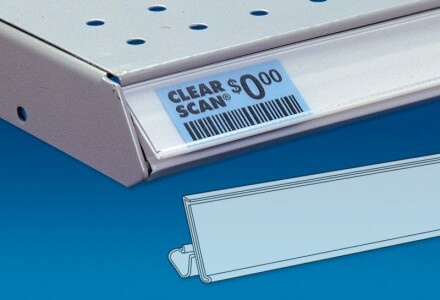 Clear Scan for electronic labels, Flip Scan® and Clear Scan® Scanning Hooks, hinged shelf talkers that call out for attention, sign holders and clips, Clear Scan for freezers and much more turn your Clear Scan into a total scanning and communication tool. The see-through front with protective roof overhang shields your labels from dirt, spills, moisture and wear. 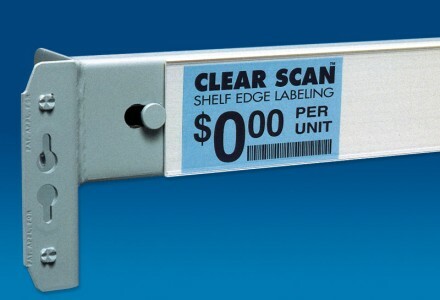 Labels last longer, read easier and scan more accurately. Employ shallow angle strips on low shelves to tilt your message up; or utilize steep angle holders on high shelves for direct, eye-level viewing. Clear Scan can actually improve the visibility of your labels. All cataloged strips may be ordered for use in below freezing temperatures.